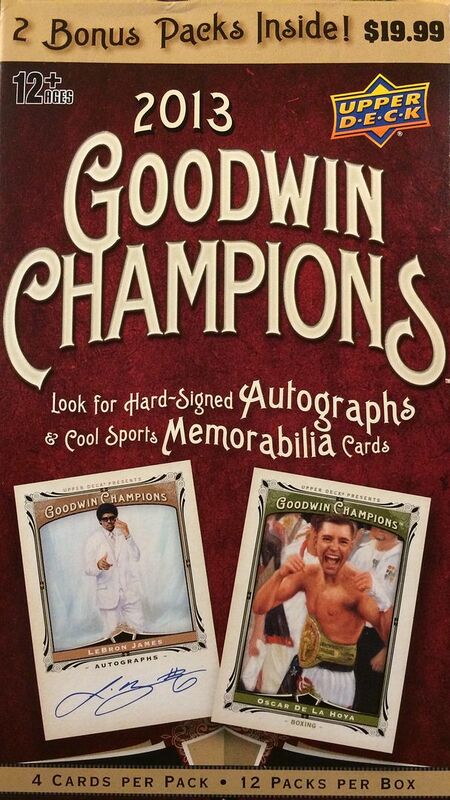 I'm a big fan of Goodwin Champions. It's a quality product that I personally think is under appreciated as a brand. There's lots to like with these cards. The look of the cards is always unique and the autographs and memorabilia hits available are top notch. If you like a variety of different sports, Goodwin Champions may be just the product for you. There are twelve packs of cards per blaster, which is a nice amount to open up. Collectors who buy this will have a nice stack of cards to enjoy. 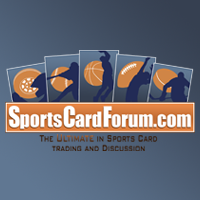 And these cards are definitely enjoyable as you'll find a wide array of sports figures in the mix. Though I primarily collect hockey, I love the fact that there are other very well known athletes that can be found here. It would be great to get a hit from this blaster, but that's a tall order here at the retail level. It's not impossible, but the odds are stacked against you. Unlike many lower-end products though, getting an autographed hit can be great as those are signed on-card. Upper Deck really loves to entice people to purchase the product with pictures of both Jordan and LeBron autographed cards on the box art. There wasn't a hit in the blaster, but I was pretty happy with the names that came out of this box. 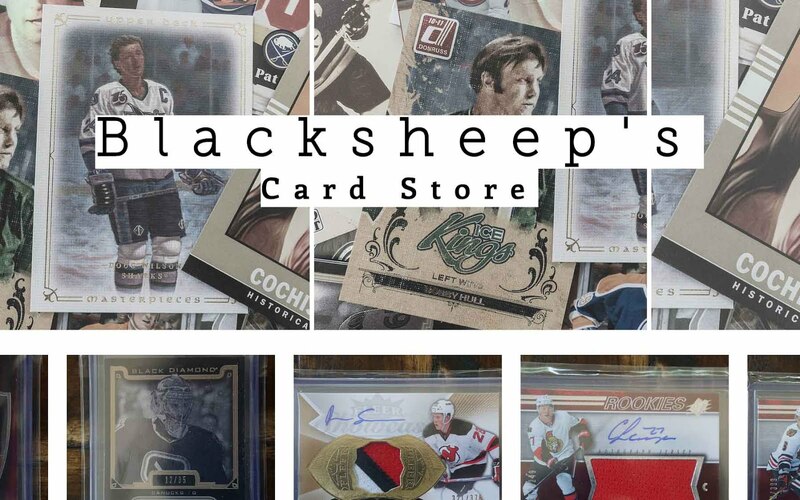 For a hockey collector like myself, there were plenty of cards to enjoy. In fact, I was able to pull some of the biggest legends whoever played in the NHL out of this blaster. These cards make great additions to my hockey card collection as they stand out from the rest. Besides hockey I got some great baseball and football players as well as Michael Jordan himself! Jordan is always a good pull - even if it's just his base card. I was also able to get the guaranteed 5 mini cards and an insert from the break. Goodwin being Goodwin means that there are going to be cards that are out of this world... literally. 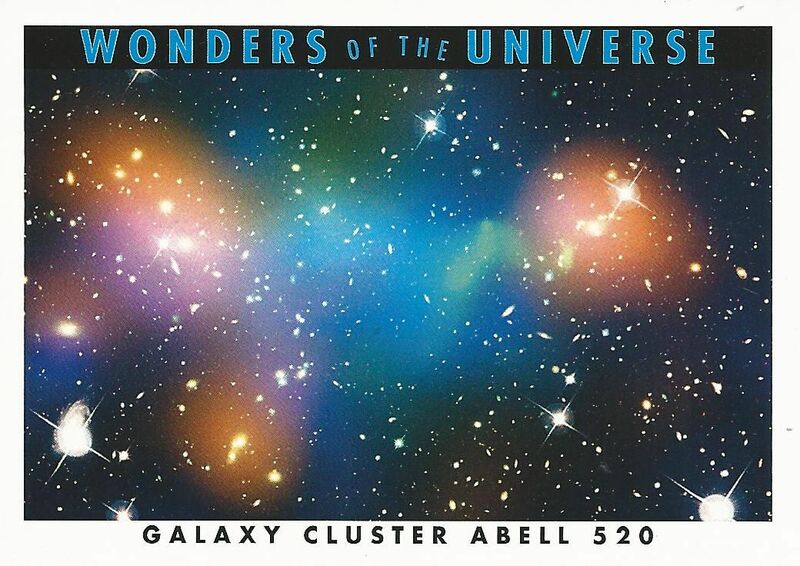 This Wonders of the Universe card highlights some geeky space science stuff which I find fascinating. 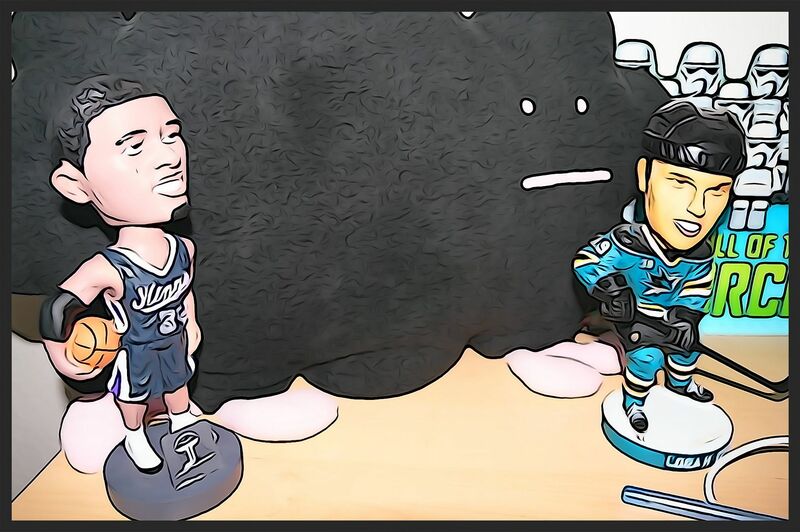 Just like with Michael Jordan, getting Wayne Gretzky is always good. This card features him in Canadian red colors and looks like it could be a painting hanging up in someone's large mansion somewhere. 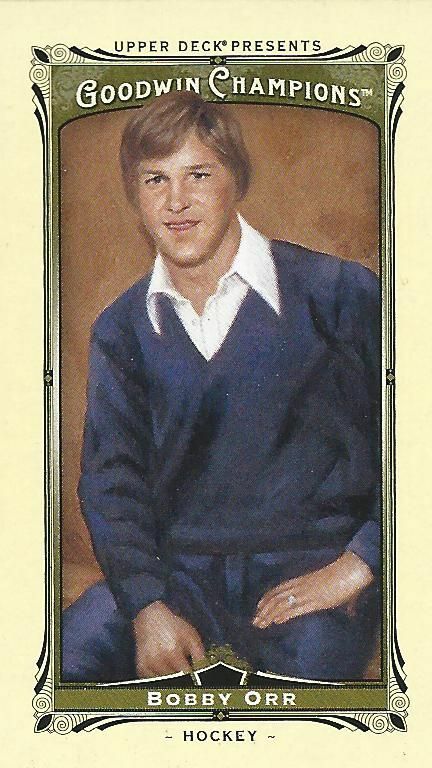 My favorite mini card from the blaster was of Bobby Orr. Orr is one of the most legendary players who ever skated in the NHL. 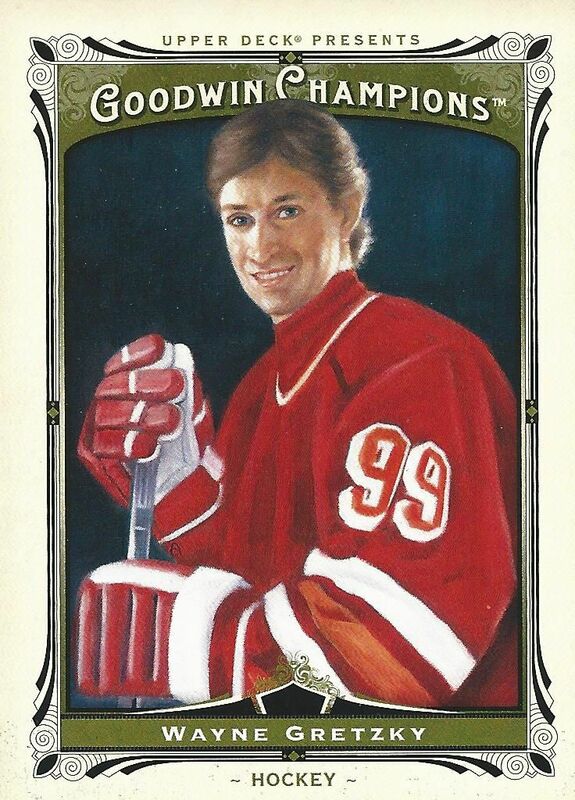 This card gets the nod over Gretzky because it is a parallel mini card rather than just standard base. I had a really fun time with this blaster of Goodwin Champions and I would definitely try my luck at it again. Blasters like these don't cost too much but bring a lot of enjoyment to them. I haven't hit much when it comes to Goodwin Champions, hopefully one of these days a hit will come out for all of us to see on Retail Review.